You are here: Home » News » KT Series Industrial Hydrogen Torch put to the test! KT Series Industrial Hydrogen Torch put to the test! KT Series Industrial Hydrogen Torch sets the standard for hydrogen brazing, welding, and soldering! This isn’t the first time we’ve shown how our industrial hydrogen torch beats Oxy-Acetalyne, Propane, and MAP-gas torches hand down, but this is the first time we’ve shown the NEW KT Series industrial hydrogen torch systems in use in the real world. Once again we’ve blown our clients expectations out of the water and delivered a world class product that consistently proves itself as the best in class industrial hydrogen torch available.Customers find using water as a source of fuel for a torch system is more efficient, economical, safe, and green as compared to torch systems that use bottled gas. Using on-demand hydrogen gas to power a hydrogen torch doesn’t produce noxious fumes in the way the oxy acetylene torch setups do. Since these fumes can be harmful to your employee’s health, the KT Series Hydrogen Torch is a much safer option. Furthermore a hydrogen torch out performs oxy acetylene torches because it concentrates heat only in the spot where it’s needed. 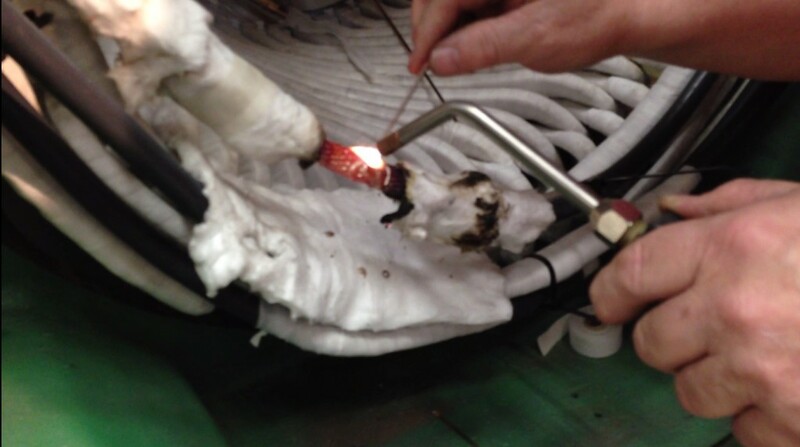 In the video you will hear one of the technicians talk about how the cable’s insulation would normally be charred and burned from the heat dissipation when using an oxy acetylene torch. He notes however that the hydrogen torch doesn’t seem to cause the same problem. The KeiperTech KT Series Industrial Hydrogen Torch Systems are the most efficient Hydrogen Generators / Hydrogen Torch systems on the market. This system eliminates the need for bottled gases as it produces hydrogen and oxygen on demand from a built in 1.5 gallon water tank. Both of our air cooled models, the KT20-120 and KT20-220 are available for order today!